Upgrades the login system by storing hashes using bcrypt instead of md5. Disallows sending private messages while the user has the receipt of private messages disabled. Makes it so that subdomains can be used for staging without keeping staged databases. Scans the specified custom template groups and renders all templates in those template groups. Extend MyAlerts with 25 extra alerts related to moderation actions such as closing, opening, moving, sticking, approving threads and posts and many more. Quickly refer to any thread across the entire board by typing an hashtag (#) and searching for its title. 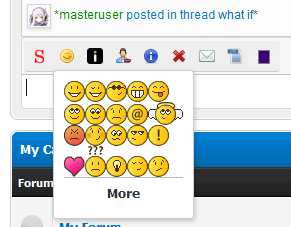 This MyBB plugin change forum&apos;s language according to the user&apos;s browser language. Adds a whiteboard when writing messages. Allows you to create sharing links to Facebook, Google Plus, Twitter and LinkedIn. Allows to setup a collaborative environment where some users can vote and rewards people who contribute significantly in the last month. Allows triggering of immediate user promotions.